“I am pleased to announce that South Monmouth Regional Sewerage Authority has been recognized for its innovation in making its wastewater pump stations more resilient to large floods like in Hurricane Sandy,” Smith, who in 2013 helped SMRSA obtain a much-needed increase in its reimbursement from FEMA for its project works after Superstorm Sandy. For instance, one of the pump stations in Lake Como had been submerged in five to six feet of water in Sandy, subjecting it to damaging corrosion. “By constructing three flood-resilient pumping stations—including two stations in large trailers that could be removed from flooded areas in natural disasters to avoid damage—SMRSA achieved a victory of innovation,” Smith said. The third station replaced an older station that was located in a 100-year flood zone. The South Monmouth Regional Sewerage Authority’s pump stations were one of only 30 clean water infrastructure projects nationwide to be recognized by the EPA for excellence, as part of the agency’s Clean Water State Revolving Fund which provides low-cost financing to communities for water quality infrastructure projects. 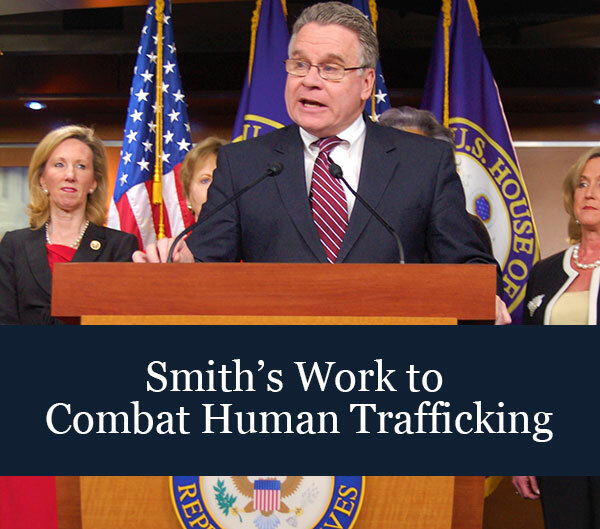 Smith cosponsored the amendments to the Clean Water Act which created the fund. Infrastructure projects of state or local governments, public utilities, and private entities were recognized by the EPA’s 2018 Performance and Innovation in the SRF Creating Environmental Success (PISCES) program. In 2013, Smith personally appealed to FEMA Administrator Craig Fugate to approve a 90 percent federal share for FEMA funding going to Jersey towns to pay for cleanup costs—instead of the initially planned 75 percent. Fugate approved the 90 percent ratio several weeks later. In November of 2013, the authority received a FEMA grant of over $2 million, a 90 percent share in the replacement of the Lake Como Water Pump Station destroyed by Superstorm Sandy; they had already received a FEMA grant of over $1 million to replace the Pitney Avenue Pump Station in Sea Girt. The South Monmouth Regional Sewerage Authority (SMRSA) provides sanitary sewer conveyance and treatment for Monmouth County’s coastal towns of Belmar, Lake Como, Spring Lake, Spring Lake Heights, Sea Girt, Manasquan, Brielle, and Wall Township, all of which are in Congressman Smith’s 4th Congressional District.